Calusa Bay North Condos: This light, bright unit won't disappoint! This recently upgraded home features quartz and granite countertops with beautifully refaced cabinets in both the kitchen and baths. You can relax in the comfortable den area filled with natural light or sit out on the screened balcony and take in the sights and sounds of the lake and fountain views. Building has a new roof! Home comes with a one-year Home Warranty! High speed, fiber optic cable and internet are available. Calusa Bay is located in a prime North Naples location close shopping, dining, beaches, and A+ rated schools. This one is a 'must see' so schedule your showing today! Calusa Bay North Condos: Beautifully appointed end unit with plenty of privacy and water view! This home features upgraded granite and refaced countertops in both the kitchen and baths. High ceilings make this home feel much larger than its footprint. This unit has a brand NEW A/C and the building has a new roof! Comes with a one-year Home Warranty! High speed, fiber optic cable and internet are available. Calusa Bay is located in a prime North Naples location close shopping, dining, beaches, and A+ rated schools. This one is a 'must see' so schedule your showing today! Calusa Bay North Condos: Enter through the gates of this lushly landscaped friendly community. This coach home community offers a resort style pool with swimming lanes, Mega View enclosure, updated clubhouse with exercise room, fishing pier, and an additional cabana pool. Take advantage of the location close to Waterside Shops, The Mercato, and downtown Naples for dining and entertainment. The beach is close by. Start the day with breakfast on the large lanai enjoying your lake view with fountain. Enjoy a morning walk around the scenic lakes with tropical plantings or a game of tennis. New high quality roof tiles have been installed throughout the community. Calusa Bay North Condos: Calusa Bay North Gated Community! Fabulous turnkey 3/2 Coach home. Gorgeous Water Fountain view and lush green landscape. Condo has safety interior sprinklers throughout, new garbage disposal, new refrigerator w/ice maker, new tile roof, screened lanai and 1 car garage. Calusa Bay community sits on 16 acres of stocked lakes, 2 mile nature walk, 2 pools, Clubhouse, Fitness Center, Library, Sundeck, Spa/Jacuzzi, Fishing Pier, and Tennis Courts. 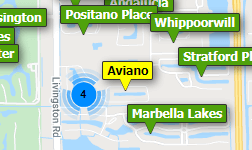 Within a minute drive you can shop at The Mercato or spend a relaxing day at Vanderbilt Beach. This well maintained condo is a "MUST VIEW"! Calusa Bay North Condos: Immaculately maintained 3 bedroom, 2 bath condominium in Calusa Bay, for sale by original owner. Secluded location on the ground floor with excellent views of the lake and water feature. This condo comes turnkey with all interior furnishings and is move-in ready. Updated with electric storm shutters – the unit survived Hurricane Irma with only a cracked window and didn’t even lose power. 1 car garage. Calusa Bay's amenities include a recently updated clubhouse, combined pool and lap pool, spa, a secondary pool known as the Cabana Pool, Fitness Center, 2 Har-Tru Tennis Courts, The Olde Florida Walking Trail (1.3 Miles), and even a lending library (founded by this unit’s owner!) Great location on Goodlette-Frank in North Naples. Enjoy the close proximity to Vanderbilt Beach (4 Miles), Whole Foods and the shops and restaurants at the Mercato (2.2 miles), shopping and dining at the Waterside Shops (4.1 miles). Need professional assistance selling your property at Calusa Bay North Naples? Find out how an Area Specialist can help to generate more property exposure in order to get the most money for your investment in the least amount of time.